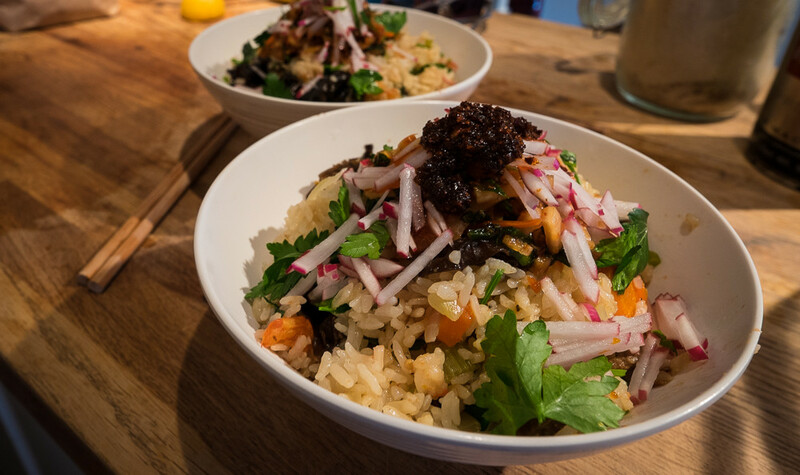 This is a one pot rice recipe that you can customize to your heart’s desire, the only exception is that you must always start with a few basic ingredients. This recipe works, it’s really delicious and a time saver. You basically throw everything in the rice cooker, or pot if you cook rice in pot, and your meal is ready when your rice is cooked. I have tried this recipe three times now and each time with a different slant of ingredients and it always comes out beautifully. It’s sort of like a stone soup, if you’ve heard of that story. Except it’s with a tomato. Except it’s tasty even with just a tomato. When I decided to give this recipe a try, I was tired and hungry after work, there wasn’t much groceries left in the fridge and I didn’t have the energy to get groceries or cook P and I proper dinner. Desperation leads to openness in trying new things I guess, so I eyed that lovely organic red tomato sitting on my kitchen island. Boy am I glad I gave this recipe a whirl. I love cooking late into the night. I love the smell of sweet spices filling the cool evening air. And I love how the action of making food makes me feel rejuvenated after a long day. Still tired but a happy type of tired that makes going to bed a pleasure. 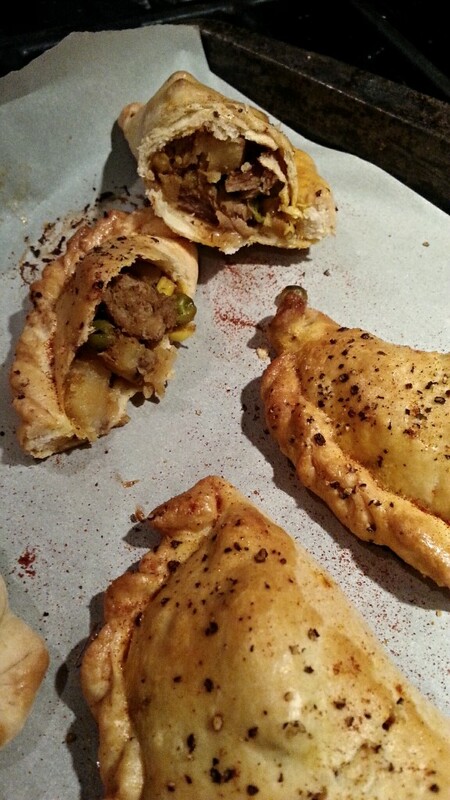 This evening, I made meat pasties, a type of small pie that you don’t need a pie mould for. It’s basically like empanadas except they’re baked and not fried. 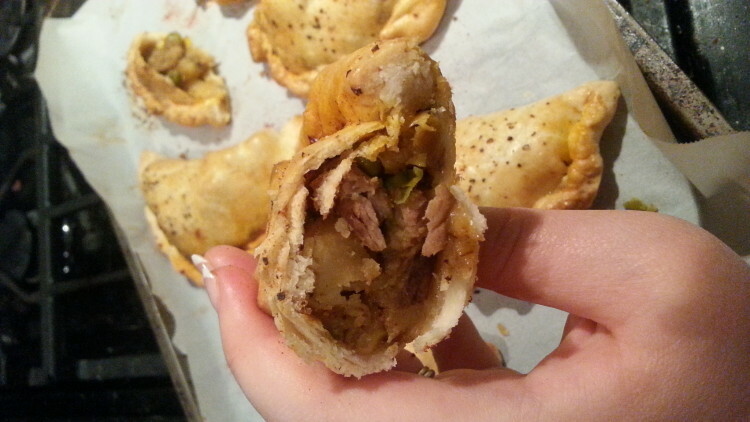 Yes, empanadas is the perfect comparison to meat pasties. Perfect portable meals. My meat pasties are made of pork. Leftover pork curry, to be precise. The curry is drier than usual, as it uses very little liquid. It’s supposed to feel more like a kheema. To make the filling, you want something that’s not too saucy. However, feel free to use any meat filling you’d like. You can also make it vegetarian by replacing the meat with vegetables, tofu or meat-replacements. Make curry. Heat oil, add cinnamon stick, star anise and fry onions, garlic and ginger for about 5 mins. Add potatoes and pork in and cook for another 5 mins, or till the meat and onions are brown around the edges. Season with salt and pepper. Add curry powder and half of the garaam masala. Stir well to coat and to toast the spices. 2 minutes. Add tomatoes in. Stir and let it come to a simmer, till most of the liquid is gone but still juicy. About 10 minutes on medium heat. Now, add remaining garaam masala and cook for 15 mins. If it’s too dry, add a tablespoon or two of water. You want the meat to be wet enough to be juicy but not soaking in liquid. I find the diced tomatoes to give it the curry enough liquid for this dish. In the final minute, stir in yogurt. Set curry aside till cool to use later. Preheat oven to 400F or 200C. Make pastry. Combine flour, salt and butter till crumbly. Add water and knead gently till smooth. Do not overknead. Let it rest for for approx. 20 mins. 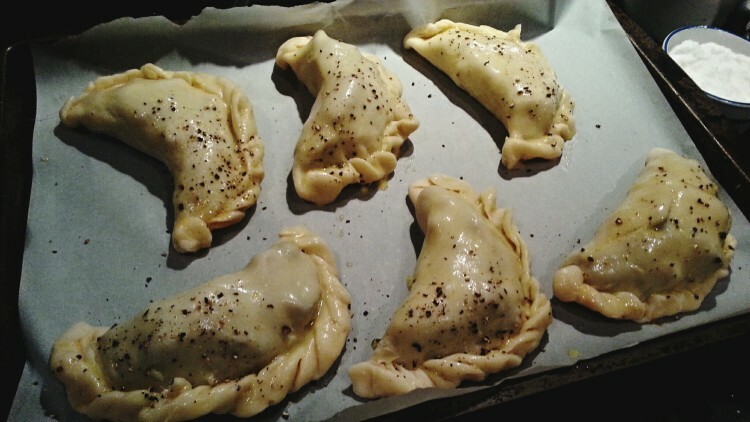 Assemble meat pasties. Separate dough into 12 balls to make hand size pies, about 6 inch wide. Flatten and roll the dough balls into a flat shell. Spoon 2 tablespoons of filling and crimp the edges shut with a bit of water. You can get fancy with the crimping design or just use a fork. Repeat till filling is all used up. Apply egg wash over each pastry. Sprinkle some freshly cracked black pepper over the top and bake for 30 mins or until golden brown. Each pie is a nice lunch size portion. And perfect for a midnight indulgence. These pies also freezes well too, just make sure to wrap them nicely to prevent freezer burn. Note: This post was created via my mobile device. I’m pretty proud of that, for some reason. Now, the muhammara is usually served as part of a mezze, which are small tapas-style plates usually served with alcohol. I think the preferred aperitif is Arak and it’s quite similar in taste, and effect, as absinthe. Muhammara is like the lesser known, but equally if-not-more-delicious, cousin of hummus and baba ghanouj. Made from a combination of olive oil, spices, roasted red peppers, walnuts, sometimes pine nuts and bread crumbs or bulgur wheat, it has multi-purpose applications. 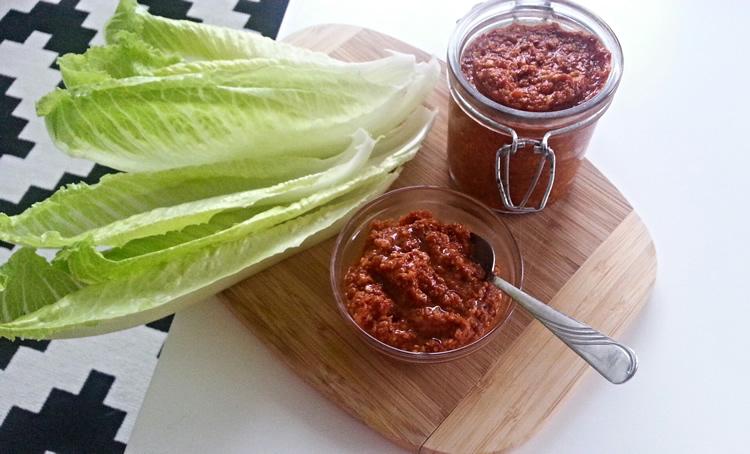 Everyone loves a good hummus but wait till you try muhammara. It’s slightly spicy, nutty and very tasty on top of pita breads, toasts, sandwiches, fresh vegetables, pasta…basically, you can put that <beep> on everything! Every household in the region makes this delicious concoction differently but it originates from Syria with the use Aleppo peppers. Since Aleppo peppers are hard to come by outside of the Middle East, red bell peppers can be used together with other dried pepper varieties. In this recipe, I found that (surprise, surprise!) Korean chilli powder does the job wonderfully as a replacement for Aleppo pepper. It imparts a lovely bright red and smokiness to the dip. Now you know what to do with your extra chilli powder after making kimchi! There’s been a lot of eating here but nothing to blog about. Balancing life and work is not easy especially when there is only 24 hours in a day and you need at least 6-8 of it for sleeping and another 8 for working and another 8 for family and life. Luckily there is always time to eat tucked in somewhere the hours for family and life, yes? And the cool weekend with the sun making a cameo throughout the day inspired me to make something warm, hearty and delicious. Our summer days are numbered..le sigh! I went to Whole Foods and saw an incredible deal on whole pork leg roasts. Weighing at 2.5lbs for under 20 bucks is pretty good deal in my books, especially since it’s organic, local and ethically raised. This was going to feed about 4-6 people or 4-6 dinners. I wanted to honour this animal with a simple pork roast recipe. Simplicity and back-to-basics was my aim here so I rubbed the lovely pork with some salt, pepper, minced fresh garlic, yellow mustard powder and dried thyme. These are complementary flavours that just cannot go wrong for roast meats. You can rub the spice liberally over the outside of the roast but I like to take it up a notch by butterflying the meat so I can season the inside as well. You can omit this step and it’ll still taste pretty grand but I do recommend that if you can muster up the effort to do so, do so. Use twines to tie up the roast to keep it tight and even all around. You do not have to do this but since the recipe is such a simple one, it makes a difference to the end result when you do the little things like making sure the roasting surface is even by tying it with twine, rubbing and seasoning the meat well inside and out, browning it for flavour, giving the roast enough space to cook evenly all around and using low and steady heat to ensure a moist and tender end result. TL;DR: Every little step contributes to a better product if it’s a simple recipe. 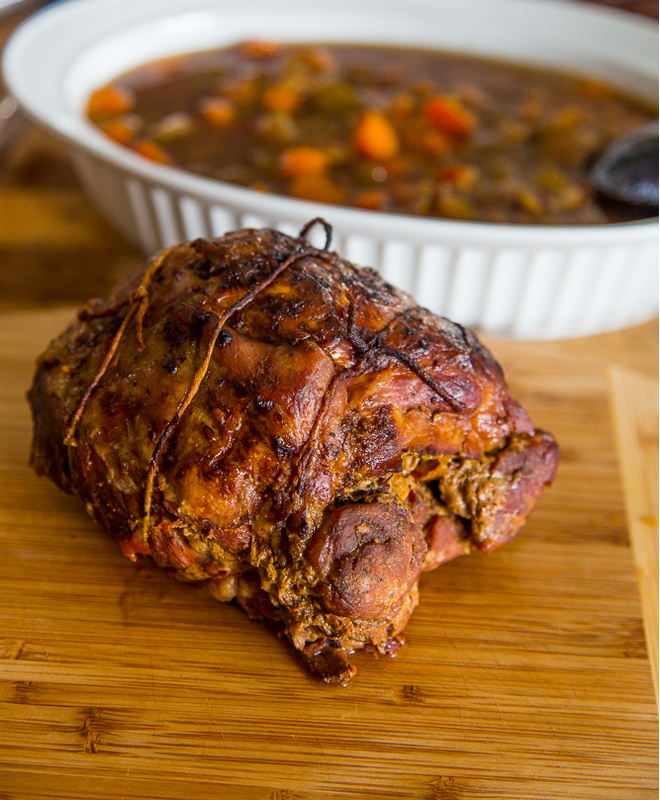 Pair the pork roast and its juices with rice, pasta, potatoes (mashed or otherwise) and vegetables of your choice and you would have a full meal. The best part are the leftovers, which makes for delicious sandwiches or toppings on your pasta, soups, salads – the possibilities are endless. When I was a little girl, I was not very fond of coconut. There was something too coconutty about coconut flavours that it overwhelms my tastebuds. I was a child, my sense of taste wasn’t fully developed to appreciate the flavour of coconut – at least that was my excuse. It wasn’t till I was a bit older that I realized it; I wasn’t disliking coconut, I was just disliking the flavours of the processed extract of coconut. Fresh coconut, it’s flesh and water, virgin or otherwise transformed, I do very much like. It was probably very telling when I liked certain coconut products but not all. And I am glad to report, I do like coconut after all. And since that one time I saw a cake, iced in glorious white flakes, I have been wanting (dying) to make a coconut cake with all it’s glory. 🙂 My version of a coconut cake is a dense but light (I’ll get to that in a bit) cake with an Italian meringue icing flavour with my homemade coconut extract! I got that idea from Alton Brown. I had researched a lot of recipes, of cakes and icings, and I came up with this recipe as an adaptation to every awesomest cakes out there. I call this my own version of a coconutiest coconut cake. Be forewarned, you’ll need to think about this cake a week in advance if you want to make it with your own homemade coconut extract (recipe below). 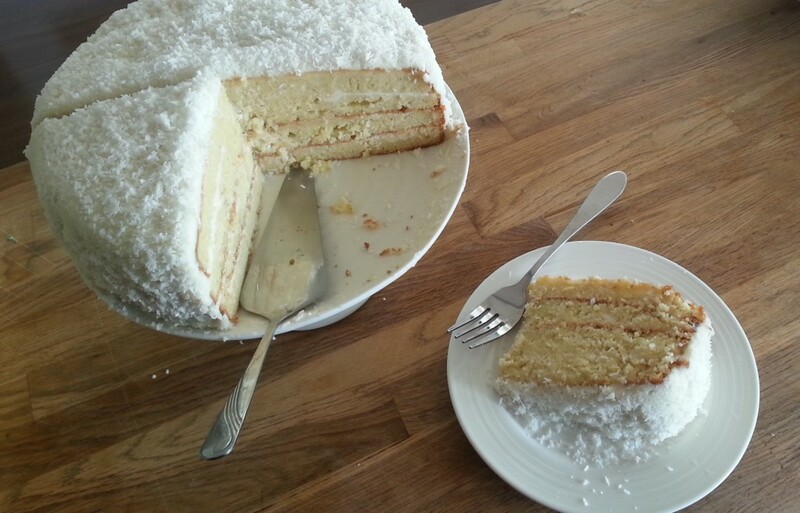 You could skip the extract too, it just won’t be the “coconutiest coconut cake” any more, it’d just be “coconut cake”.